So, I thought I would bring you up to date on my low tunnel experiment. I didn’t get a chance to put a low tunnel to work in my garden, but did get one installed in Mary’s raised bed on Saturday March 15. The bed we used was her 4 by 12 foot bed which is bordered by 2 by 12s. The bed is filled with manufactured soil (50% leafgro-50% soil) and fertilized with 10-10-10 (one pound) to add .2 lbs. of N per 100 square feet. This picture shows the partially planted bed. 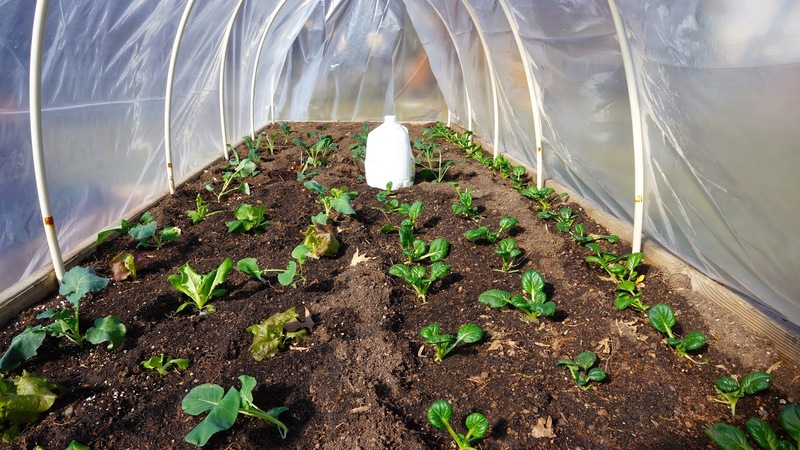 Plantings in the bed are Packman broccoli, tatsoi, Tuscan kale, Red Sails and Butter Crunch lettuce. The full planted bed looks like this. The PVC hoops are spaced about two and a half feet apart and tied together using another piece of PVC pipe at the top of the hoops and either tied or taped in place. The plastic cover is 4 mil plastic purchased at a local hardware store. It was stretched over the hoops, wrapped around some 1 by 2 the furring strips and attached to the 2 by 12s using screws. 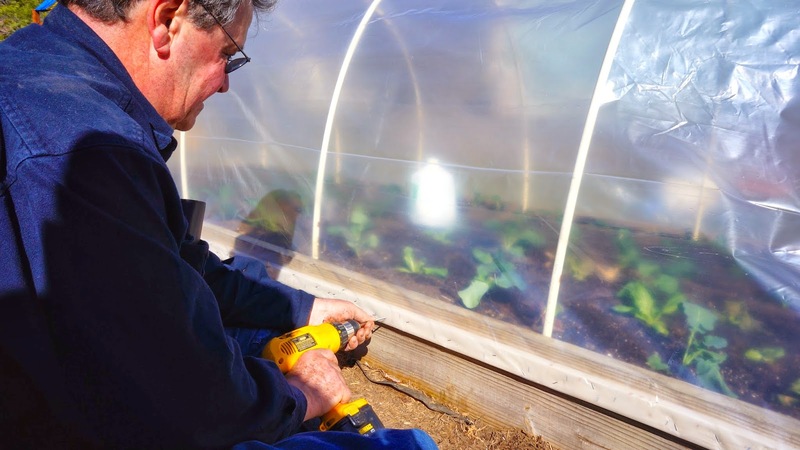 The ends were loose so that the low tunnel could be ventilated, less it build up to much heat and cook the plants. This last picture shows the impact of 9 inches of Howard County snow, we received Sunday night and Monday. Mary told me that late in the day she had to open up one end of the low tunnel because the interior had a lot of condensation on the plastic sheeting. Hopefully these plants will like their new environment and provide some early April and May greens and broccoli for Mary’s table. The only thing left to do is to install the drip irrigation since plastic isn’t permeable. 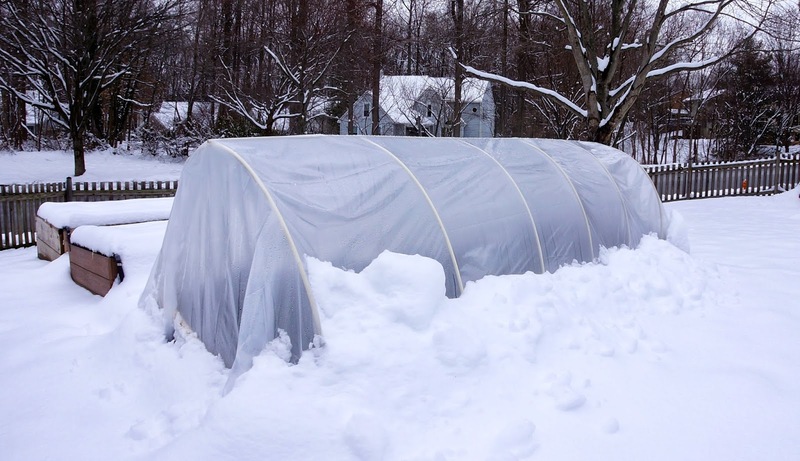 I’ll update this experiment with low tunnels, but Mary should have great success as long as she remember to ventilate it on sunny days.